NASHVILLE, TN – There is an unflattering picture of Congresswoman Marsha Blackburn (R- TN) on a billboard heading South toward Franklin on I-65. It’s meant to be ugly. Blackburn sponsored a joint resolution to remove Internet privacy protections ordered by the Federal Communications Commission last year that were about to go into effect. 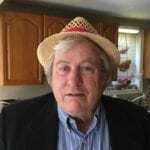 “We must stop the FCC’s Net Neutrality rules, which are nothing more than a Trojan horse for government takeover of the Internet. These overreaching rules will stifle innovation, restrict freedoms, and lead to billions of dollars in new fees and taxes for American consumers.” Blackburn said. The House passed Blackburn’s bill March 28 by a vote of 232-184 and President Trump signed it April 3. Tennessee Senators Alexander and Corker voted for and Representative Jim Cooper voted against it. The FCC can’t re-issue those rules without a new act of Congress and the new FCC chief isn’t about to even if he could. FCC Chairman Ajit Pai wants to loosen restrictions on big service providers like Comcast and Verizon. The FCC privacy rules required Internet Service Providers (ISP) to get consumers consent before sharing their personal information with third parties including but not limited to their finances, health, web browsing history, and app usage, and geo-location. Consumers would have to “opt in” before ISPs could sell their sensitive information. ISPs would have to be transparent and provide customers with notice about information they collect and how it would be used. ISPs would be required to protect the confidentiality of consumer data and notify their customers of security breaches or hacks that put their personal information at risk. But that was yesterday and yesterday’s done. 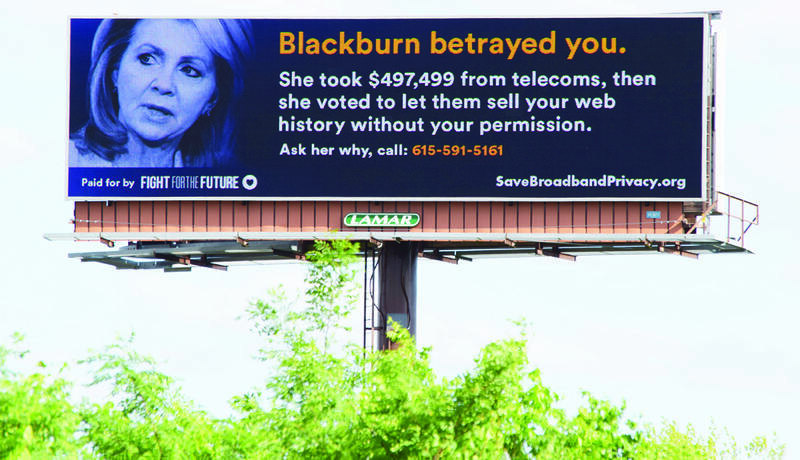 Fight for the Future is the Net Neutrality activist group that is crowd-funding a number of billboards, calling out politicians like Blackburn who voted to remove Internet privacy rules. They dispute assertions that such rules stifle investment and reduce competition. Blackburn shot right back. “The billboard is based on distortion and misinformation. Companies cannot sell a person’s browsing history. My colleagues and I voted for S.J. Resolution 34 because we are interested in a free and open Internet. The FCC’s anti-consumer privacy rules were nothing more than a big government power grab. The rules were never implemented and the status quo preserved. Your privacy protections are the same as they were last year and will be the same moving forward, “ Blackburn said. According to Cheng’s group the new Blackburn law allows ISPs to monitor and sell customer’s location data, search history, app usage, and browsing habits to advertisers without permission. They can take and sell a customer’s search results and redirect them to third party websites and insert ads into web pages that otherwise wouldn’t have them. In short, it’s good for big media companies but at the expense of consumer choice and protection. Brandi Collins is the Senior Campaign Director at Color of Change and she oversees media, economic and environmental justice work using social media to advocate, strategize, and direct campaigns for people of color. “We take on a lot of issues that are happening to the black community,” Collins said. Color of Change has criticized news outlets for biased coverage, lobbied Fox to dump Bill O’Reilly, opposed online surveillance, and helped residents in Flint, Michigan organize to get rid of lead pipes in public housing. “We believe that the right to a free and open Internet is a crucial part of movements for equity,” she said. “Throughout history there has always been a promise that comes with new media—a promise of opportunity for people who are not the elites who could speak truth to power with books, radio, and television. As we become more of a corporatized society there are more and more roadblocks put up that renege on those promises,” Collins said. The FCC chairman, Ajit Pai, is to an open Internet what Betsy DeVos is to public education or what Scott Pruitt is to the EPA. All these recent appointees have political agendas are in stark contrast to the missions of the departments or agency they now lead. Two weeks ago, the FCC eliminated price caps on broadband service to hospitals, schools, libraries, and small businesses, allowing ISP providers like ATT&T, Comcast, and Verizon to raise prices. FCC Chairman Pai has plans to end Net Neutrality rules passed two years ago that prohibited ISPs from favoring some content over others. According to the New York Times, Pai wants to loosen government oversight of ISPs allowing them to charge more for content that will flow at higher speeds and allow them to block or even censor content they don’t like.